The drips from the faucet thunk into the stained sink, doling out time like a miser. The smell of cabbage soup fills the flat. Aleksandr says the photo will be sold in 22 minutes. He is selling it on the computer, some kind of novyj bidding thing. He says the highest bid so far is 2000 roubles, 70 US dollars. Two thousand roubles is an insult. Not enough money for a coffin let alone the operation. ‘Remember I get 20 percent.’ Aleksandr fiddles with his laptop, a model citizen of the New Russia. Olga lives in an identical two-room flat next to mine. The thin crumbling walls of the apartment complex mean we know more about each other than we’d like. She coughs and spits in the shower and sings along to old Pojuschie Gitary songs. When Olga realised I was serious she became shrewd. She assured me Aleksandr could sell the photo on the internet and some inostranec with more money than brains would buy it for a fortune. The computer looks strange on worn orange laminate of the kitchen table. Aleksandr’s fingers tap and peck over the keyboard. They are as fine and pale as votive candles. Fingers that have never known the weight of a shovel or the heft of a pick. Somehow he manages to see the keyboard through the fringe of black hair that wilts over his head and droops down his face. A metal loop pokes from the hair marking the position of his right eyebrow. He clicks on something and waits for the computer, peering disdainfully around the flat: the peeling wallpaper, the empty bottles of bathtub vodka, the piles of unwashed plates, the struggling begonia and, of course, the photo. The drip continues to count out time in the sink. Aleksandr knows that I don’t like him and that even in this feeble state I could still crush him with one hand. But he also knows that I need him more than he needs me. I shuffle over to the stove to make some tea, the few steps leaving me gasping for breath. Until Yeltsin destroyed everything in the ‘90s, Chelyabinsk was a coal town, the entire city delineated in shades of grey, as if drawn in charcoal. Emerging from the mines at the end of the day, we cheerfully scrubbed coal dust from our faces and hands. But unbeknownst to us, the dust also accumulated in our lungs, breath by breath, blackening them and forming little dark nuggets like a diorama of the mine in which we worked. The operation costs 61 000 roubles. Doctor Onishchenko at the clinic says I will die within the month without it. I pointed out a miner’s pension is only 1500 roubles a month, barely enough to afford bread and soup. He shrugged and looked at his watch. Another New Russian. As the water heats on the stove I turn to the framed photo beside the window as I have every day for the last 52 years. Age has faded her a little but she remains the most beautiful woman I have ever seen. Brigitte Bardot. Her name still stirs the ash of old dreams. I may be old, but I’m not dead yet. I fell in love with Bardot in 1955 when I was 19 years old. Stalin had just died and while we were lonely without him there were new possibilities too. The Zaryadia Cinema had begun screening the occasional foreign film, something that would have been inconceivable a few months earlier. ‘La Lumière d’en Face’ had a plot as bad as most of the Soviet movies, but it starred a young woman so beautiful, so sensual, that men – both the sober and the p’janyj – stood and declared their love to the screen. During the scene where she swims naked in the river there was pandemonium. People were applauding, yelling, standing on their seats to get a better view. At that time nobody had seen her before; nobody even knew her name. I stayed in my seat, leaning forward to concentrate. Her black-lined eyes were wide and guileless, tinged with a melancholy only I could see. Her mouth, with those bee-stung lips, was large and loose with an insolent cast. Her legs – oh, those legs! – were long, slim and strong. Even through a sweater the jut of her breasts turned me to water. For a boy studying at the Chelyabinsk Mining Academy, surrounded by the belch of industry – the tractor factory, the tank factory, the electrometallurgical works – the very existence of this woman was a revelation. And it wasn’t only that. It was that there was a country where such a woman could exist. A country where people wore exquisitely cut clothes as they walked down clean, tree-lined streets on their way for lunch at a bustling cafe. I knew it was Western propaganda but it worked: I wanted that too, all of it – the fancy drinks, the restaurants with linen tablecloths, the dancing girls, the sporty two-door cars and most of all Brigitte Bardot. And why not? I was a Russian and we were the best people on earth. We were the superpower who had defeated the Nazis. We were working together to make a nation superior to any other in history! A workers’ paradise would have all that and a Bardot for every man. Unfortunately this wasn’t a goal I could share with my fellow students. These things could be easily misunderstood, and the consequences could be dire. Bardot was a secret to be held to my heart and warmed like a hatchling. I set aside the teabags to reuse later and trudge back with the drinks. There are no end to the indignities of poverty, age and ill-health. I’m stuck with this bent back, these black lungs and my shrivelled pod of a skin. At least in Soviet times we were all equally poor and if you got sick healthcare was free. If I were Aleksandr’s age again, with my back as straight and broad as a birch tree, I’d go to Moscow and spit in the face of the politicians who’ve sold this great country to the mafia and the oligarchs. For three years running – 1958, ‘59 and ’60 – I had the highest average coal yield of any miner at the Number 5 Chelyabinsk Plant. In 1959 I mined 94 tonnes of coal in a single shift! I, Mikhail Mankov, was a hero with his photo in Pravda! I sip my tea and listen to the rattle of the keyboard and the plink of the tap. All that was gone now, so completely erased that even my memories seemed suspect. Did we really believe we could change the world and show the way to a workers’ paradise? Did we really give our lives for that dream? And what for? So pril kids like Aleksandr could chew gum and plan their London shopping sprees? I look back at the photo on the wall. It was summer when I wrote the letter, the only season where a dream like that could take flight. In winter the drunks freeze in the street and the only way to lever the chill from your bones is to go down a mineshaft and work as hard as you can. Chelyabinsk is a dirty, stinking town, but in summer, outside of the city, the fields are dotted with pink and yellow flowers and the sky is so blue it seems to swallow you whole. So it was only because it was summer and I was stupid and nineteen and in love that I wrote that letter and stuck in an envelope addressed – in Russian – ‘Brigitte Bardot, Paris’. I checked the letterbox every afternoon for four months. On 12 November 1955 a beautiful cream coloured envelope arrived, the paper thick, smooth and waxy, so different to the coarse, brown stuff I was used to. 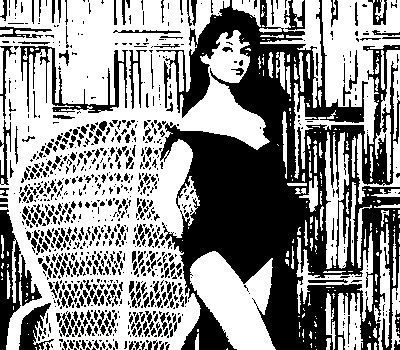 Inside was a photo of Bardot wearing a black bathing costume, her signature scrawled diagonally across the picture in a marker as black and bold as her eyeliner. My heart beat enough for five men. To think her hand had pressed against that very photo! Anything was possible. I have not been as happy before or since. In the photo Bardot stands beside a cane chair striking a model’s pose. She is turned slightly to the side, her front leg bent so her toes rest lightly on the sandy floor. Her arms are clasped behind her back, squaring up her lovely shoulders and lifting her chest. The straps of her bathing suit rest more on her upper arms than her shoulders, creating the exquisite tension that they might just slip off…Her nostrils flare as if in contempt of the photographer, and she looks away disdainfully. With her strong shoulders and proud chin all she needs is a wrench and boilersuit to be the ultimate model of the Soviet worker-hero. I have never got married, because nobody else has ever come close. I know just enough about computers to find the off button. Aleksandr tries to slap away my hand but it’s too late. The screen goes blank. He swears. My back is a little straighter as I stand. I am not a New Russian.